Hatzie update, one eye looks normal! The other is still puffy but I think it looks darker/ less hazy. Just did a water change for him and one for Stormy. Hatzie's Nitrates were at 50! That is the highest I have seen in my tanks. But his ammonia was 0. With no filter? But he does have happy live plants that grow fast. I thought Nitrates were a by-product of an actual filter loaded with beneficial bacteria. ? And since he didn't have a filter I only checked ph and ammonia for him. I have a lot to learn. I try to take care of these precious little lives! 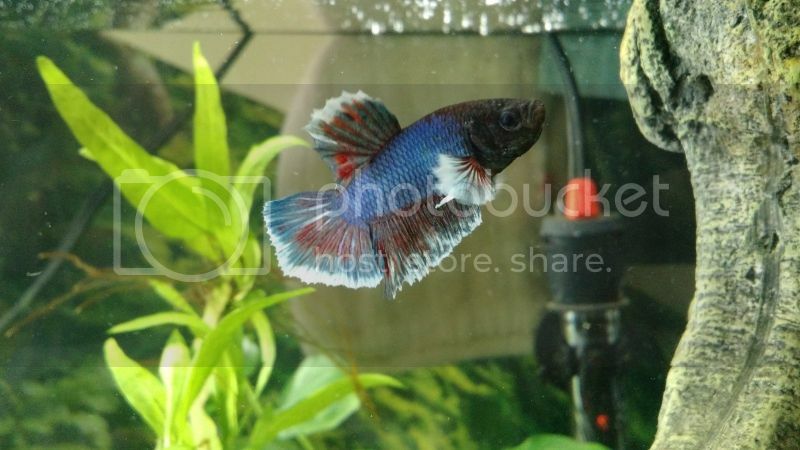 I read often about bettas but so much info is confusing or advice is contradictory. And mini horses! The smaller they are the more "tough" they have! I am going to put Hatzallah back in his real tank soon. 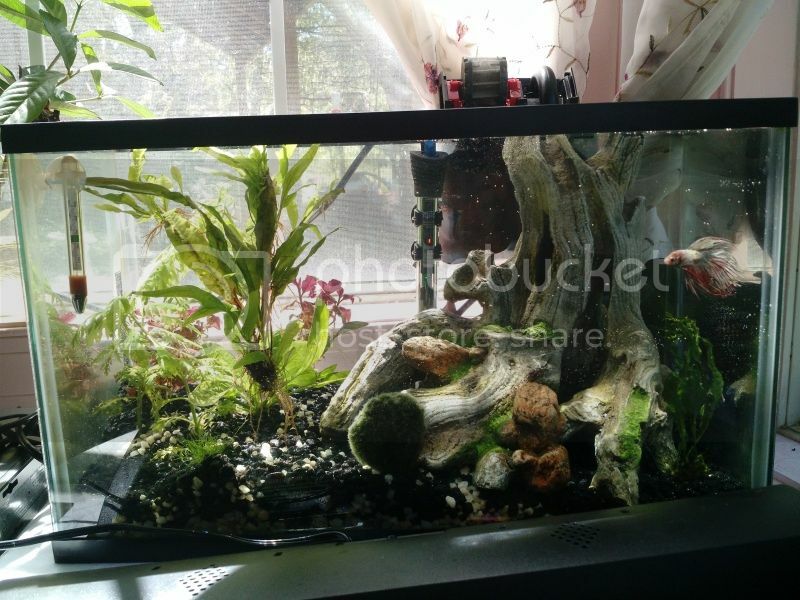 I have it all set up and took his heater out of the quarantine and into the glass tank. Now just waiting for the water to reach the correct temperature. So I was looking at my records...on 9-9-15 Hatzie's water was 6.8 ph and I did a 50% water change. Then suddenly his ph was 6.0 (maybe lower! Test doesn't go lower). I checked it from the sink and it was at 6.0. We have well water. We had a lot of rain a few days ago, I am wondering if that caused the fluctuation. And would that in itself cause pop eye? Or enough stress that when I moved the plant his body couldn't fight the bacteria I stirred up? Just been thinkin' a lot about what might have happened. I put some bio-foam from Antigua's filter and used it to baffle the out-flow of Hatzie's filter. So hopefully that will jumpstart a cycle for him. So Hatzie looks pretty good this morning. One eye has no swelling and is black (his normal eye color) and the other looks *slightly* puffy and *slightly* cloudy. I think he wants to be back home though. I am sitting next to Simeon's tank and he is staring at me with puppy dog eyes. The heater still hasn't cut off! The hospital tank is cooling off... I wonder if I am going about this the right way. Well, it is still above 81, I was keeping Hatzie nice and snug. I am seriously thinking about getting some tank mates for Antigua and Simeon. Simeon needs some entertainment as he isn't good at finding things to do, he tends to glass surf quite a bit. Antigua is always content and busy but he has room for some "friends"-or "frenemies". Antigua is so laid back I don't think he would mind too much. It has to be something that likes warm water. Not really interested in snails and while I like frogs, those African dwarf frogs don't do much for me. I LOVE shrimps but I would worry about them getting injured and now I know my ph is subject to fluctuation. So far I am thinking a few guppies? And some more silk plants. 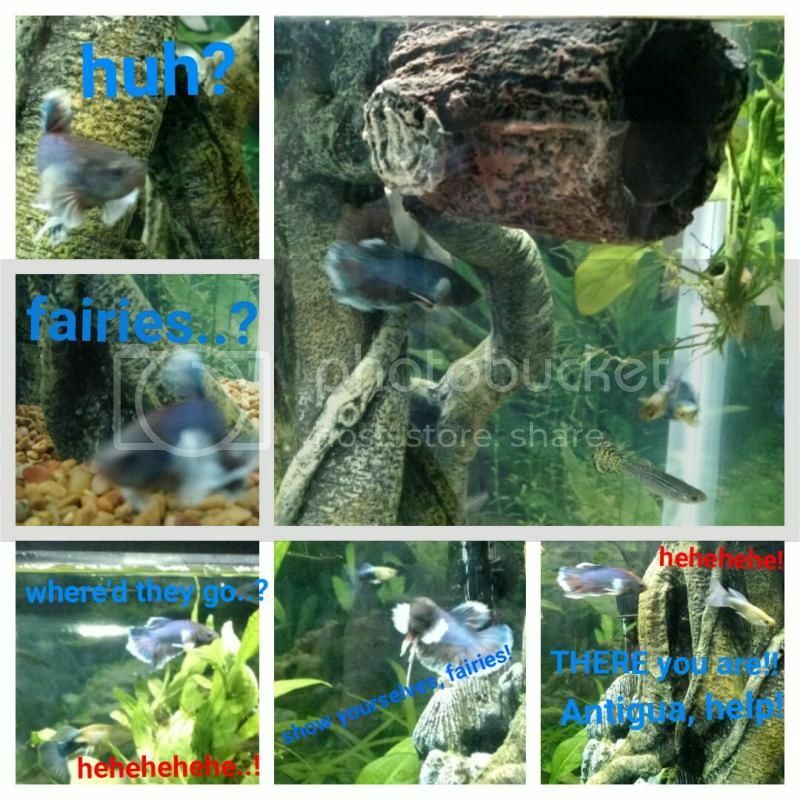 I think the guppies would be easy to rehome if need be. ...still waiting on temperature... Going to get another cup of tea. Hatzie is so happy to be home! I would say he is 90% better. I uploaded a picture of him in quarantine but maybe it is too sad to share. He was so pitiful. Here is a happy one of Simeon! He is so buff looking. Reminds me of a military man. I must say, Simeon doesn't really seem to care. He might chase them like 2 inches, sometimes, but usually he is like, "eh, whatever." That didn't stop me from using their pictures to make a comic and completely misrepresenting reality with my talking fish. Fiction can be fun. Awesome journal!! 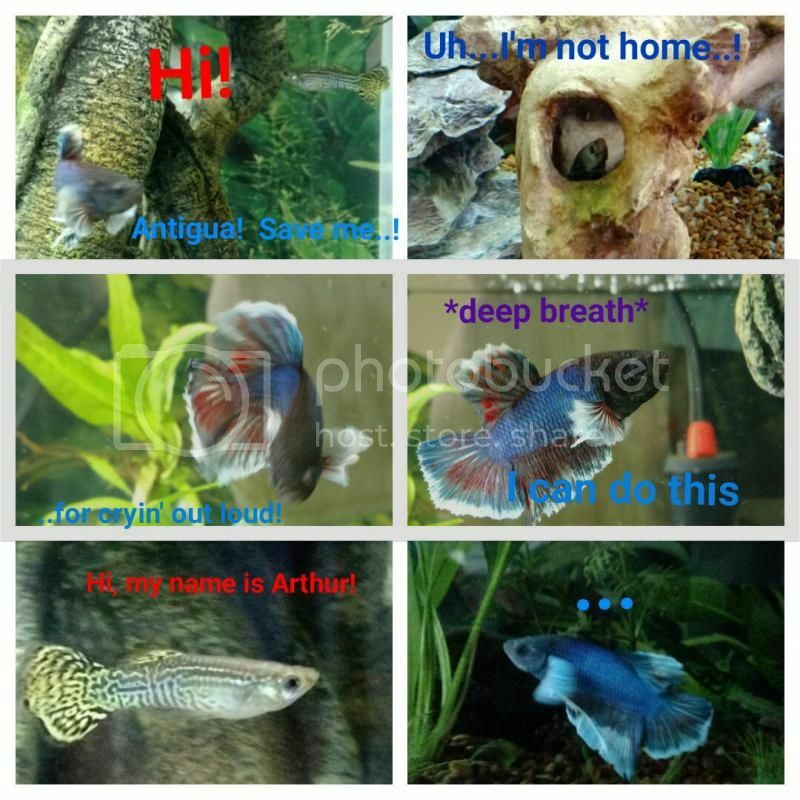 :) Your tanks and your bettas are so cool! I checked out a fish store I hadn't been to before and had a great time! It is an independent shop owned and run by a lovely couple. They had so many plants and wood for aquariums. I got a neat sword plant called a Rubin. It has reddish leaves. Also got some anarchis, cobomba and micro sword. I may have spelled those names wrong. It was way better than the fish store I usually go to. I need to take more pictures of Simeon so I can do part 3! Everyone seems to be doing well. The guppies have been here 2 weeks now. Simeon continues to...not care. He even stops and lets them "go first" when they cross paths. Today I got some Omega One "mini pellets" for them to replace the flakes the fish store had. Is it weird I bought fish from an actual fish store but had to buy quality food from PetSmart? The mini pellets seem to be the same as the betta pellets but much smaller- and it comes with a serving spoon. :) So that is good, Simeon can eat the same thing as them now. He didn't like those flakes and they have super itty-bitty mouths and can't eat betta pellets. Everyone agrees, Omega One micro pellets are nom. Nom, nom, nom. They also like frozen brine shrimp and live mosquito larva. I think this winter I will try flightless fruit flies. We like live wiggly food here. 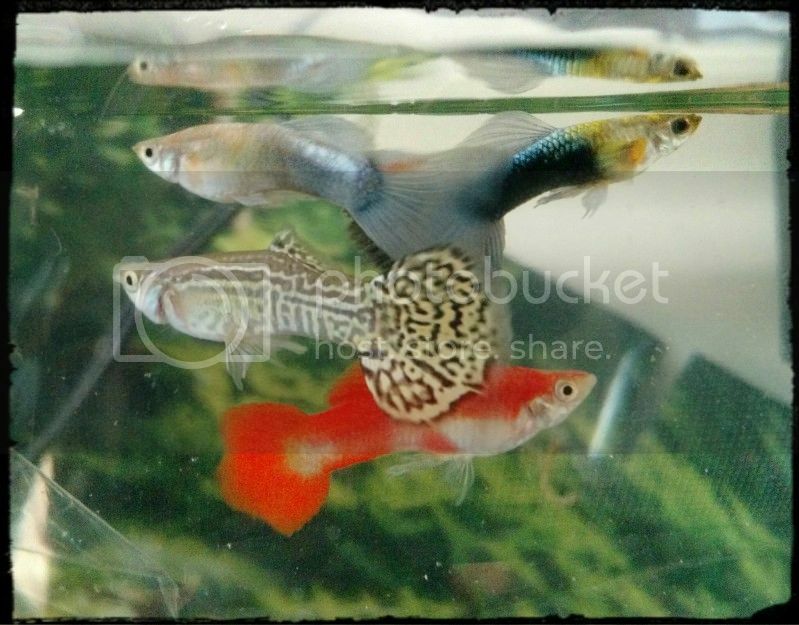 I call the guppies "gummies" because they LOOK like a package of gummy candies, all tiny and brightly colored. Need to upload a picture of Lemonade and Spotty.